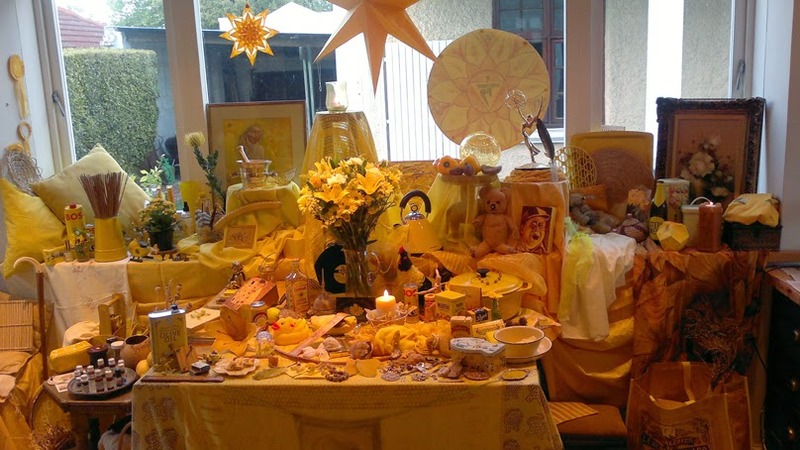 I was never a huge fan of the colour yellow until my son was born 7 years ago. Right from when he was a baby it was clear that yellow was, and still is, his favourite colour. Because of this I have over the years bought him yellow toys, items of yellow clothing and a bright, sunshine yellow bath towel. In the meantime, I have fallen in love with (certain shades of) yellow to. 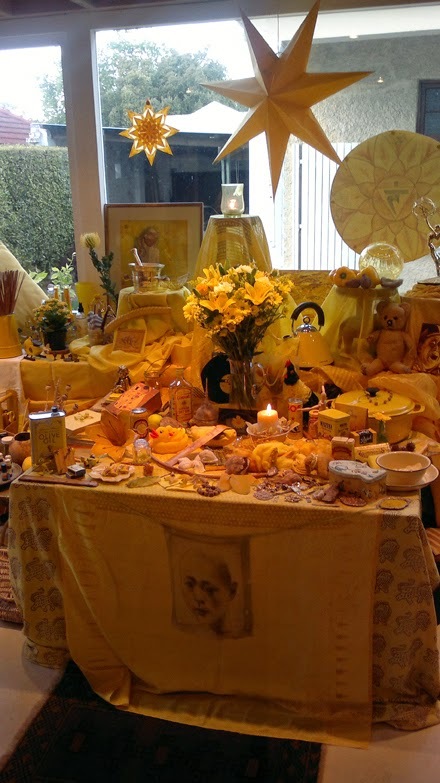 The still life that was set up in the studio for our exploration into the colour yellow was an uplifting, energising, warm and happy sight. We took time to smell some essential oils like Bergamot, Chamomile, Clary Sage, Cedar wood, Clove, Geranium and Lemongrass (my favourite). We mixed up our six shades of yellow paint. I found it hard to get tonal variations without going too green or too brown. 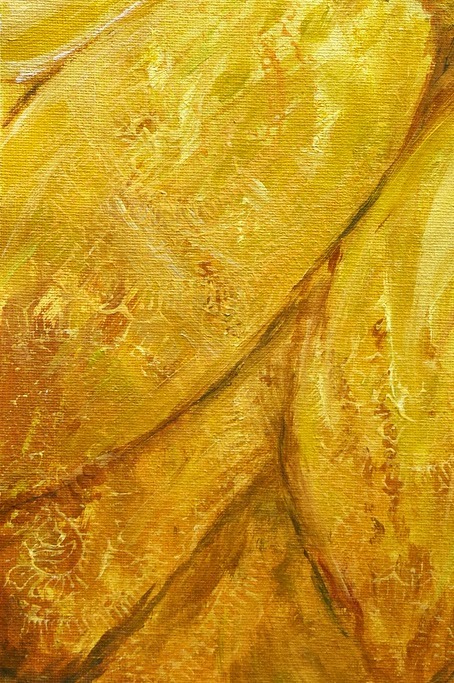 After a short meditation, I painted my canvas sheet with a warm sunshine yellow. This then lead me to painting a large, round sun in the top right of the page shining down onto a landscape of yellow hills. I was going to stop there but we weren't even half way through the class yet, so I decided to add some texture using the Indian printing blocks that I love so much. I started to see a close-up of a sunflower in my picture. At first I resisted changing from my original landscape. But the sunflower wouldn't go away, so I decided to go with it. The sun became the centre of the flower and the landscape became petals. 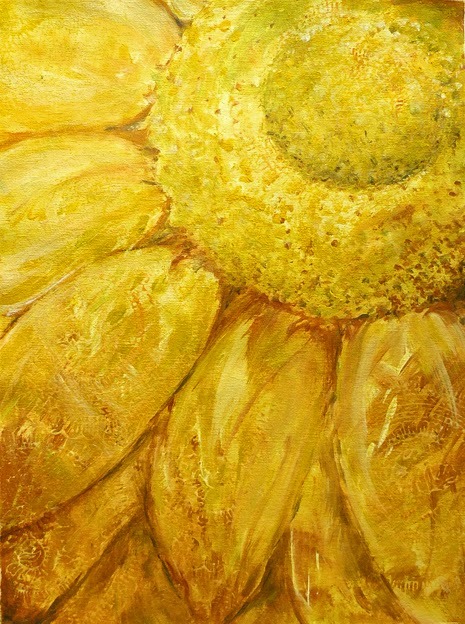 My end result, a bright, sunshiny yellow sunflower. I love the textures that the Indian printing blocks add to a painting. It's not surprising that I ended up with a painting related to something "sunny". The third Chakra is also called the SOLAR Plexus Chakra. relating to or determined by the sun. relating to or denoting energy derived from the sun's rays. The Solar Plexis Chakra is located between the navel and solar plexus. It is your power centre - your Core Self - and is all about who you are. It is the centre of your self-esteem, your willpower, self-discipline, as well as warmth in your personality. By consciously harnessing the energy of the Solar Plexus Chakra, it helps you to be proactive rather then reactive or inactive. You have the power to choose. You can choose to achieve your life purpose. The Sunflower has been adopted as a symbol of happiness and strength. The flower always turns its face to the sun and is therefore considered by some to be a symbol of faith. Some believe that the sunflower represents a constant search for light, or enlightenment. Loving this series. And envious of your art teacher doing setting up those colour displays - looks like such fun!